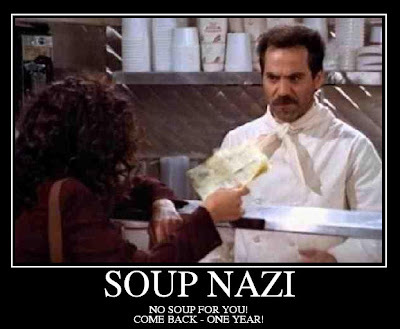 The weather is cooling down here (and by cooling down, I mean it's not in the 90's anymore), and I've been craving some soup. When I make soup, I can't help but think of this guy. Who doesn't love Seinfeld? If you don't, I'm not sure we can be friends. Have any of you ever had the Baja Enchilada Soup from Atlanta Bread? Well, it is our favorite, but I never see it there anymore. I found this recipe on pinterest and had to try it. I did make some minor changes. And it was freakin' awesome. 1. In a large soup pot, saute onion and peppers in oil over medium high heat, until soft--about 5 minutes. 2. Add all other ingredients and mix until well-blended. 3. Let simmer over medium heat for 10-15 minutes. *for thicker soup, make a cornstarch/water paste and stir into soup, adding until you get desired thickness.